The 'Walk' hitmaker wowed London's Roundhouse with his first show in the capital since the release of his debut album 'Love + War' last month, following a UK tour and dates around Europe. Two tracks into his set, he explained to the audience: "Now that I've got your attention, I'd like to say it's nice to see you all again! You see we've been all over the place. We've been in what feels like a different country every day, week and month so it feels good to be home. "Thank you all for being here. It means a whole lot and that's from the bottom of my heart." The critically lauded singer, 25, opened the show with the tension-building title track from the record before showcasing other songs from the LP including 'Layback' and 'Look Over Your Shoulder', during which he introduced his band and flaunted his dancefloor talents with a flurry of choreographed moves. The MTV EMA and MOBO nominee - whose full name is Kwabena Adjepong - showed off his versatile voice for over an hour at the venue, where he stripped back his sound to sing 'Forgiven' and his cover of James Blake's 'The Wilhelm Scream' before raising the roof with a rendition of Major Lazer's 'Lean On'. Later, he brought out rising star Zak Abel - who opened for him earlier in the evening - for a duet of emotional ballad 'Cheating On Me' which proved to be another of the show's many highlights, as well as encore tracks 'Walk' and 'Perfect Ruin'. 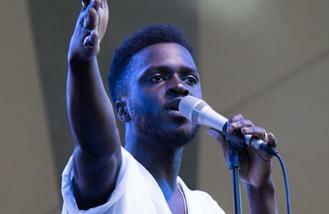 With over two years of touring experience, Kwabs' stage show is better than ever and by the sound of his debut release, his is a name we'll be hearing far more about in the future.